Where’s the reverse button on this thing? I’m at 100 posts already and can’t figure out how the heck I got here. I’m not ready! Where did the time go? I’m still a baby food blogger! 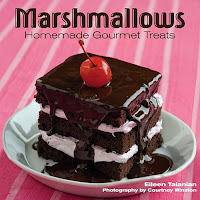 In honor of these new triple digits I’m giving away some homemade coconut marshmallows and one of my favorite books, “Marshmallows, Homemade Gourmet Treats” by Eileen Talanian where I found this impressive recipe. Well hopefully you’ll get the marshmallows, if I keep my paws off them long enough to send them to you! If you’ve never had homemade marshmallows you must try them! You may never eat another store bought tasteless sponge again. All you have to do is post a note stating your favorite food and why it’s a favorite. Just write a comment, and my 7-year-old will draw a number out of a hat Tuesday July 14th at 8p.m. I’m excited to see your answers, and hope it tells me a bit about you! I want to thank-you for all the support and friendship. I didn’t really understand what a food blog was when I got started, and it’s been a pretty big learning curve. So big really, that just when I think I grasp a new idea, another one comes along and off I go again attempting to learn like crazy. This happens several times a week and I’m still climbing that mountain. So any food blog advice you want to throw at me I’m all ears! Since my first post on March 23rd I’ve had 144,931 visits, which completely shocks me. I didn’t think my food blog would get much attention, but I guess I was wrong. Although that first post of Plum Good Sour Cream Coffee Cake never got any love! Through this process I’m learning how to be a better food photographer, writer, and cook. I’ve also met wonderful new friends here. Many stand out, but I want to honor the first. Kathia Castro from http://pinklittlecake.blogspot.com/. I didn’t know it at the time, but she had been ogling my food images over on MySpace. She didn’t have an account so she never commented, but she got here almost the day I started writing. She then immediately introduced and advertised my blog on hers. Kathia believed in me before I even had a clue what I was doing, and with that little post of hers I found the courage to jump into this project. Kathia, I am more grateful for you than you know. Thank-you for coming along on this journey with me. It means the world to me. This is the syrup used to make all the recipes in Talanian’s book. It makes approximately 1 quart, which will keep in a covered jar for up to two months at room temperature. You must let the syrup cool for 15 minutes before pouring into jars, or it will crystallize. Author’s Notes: The syrup will be very thick once it cools. To use it, microwave for 2 minutes on high power. Do not stir the syrup. Please read all the instructions and have everything in place before beginning. Place the ingredients in a heavy 4-quart saucepan, stirring gently with a heatproof spatula until the sugar is moistened. Bring to a boil over medium-high heat, and cover the pan for 2 minutes to allow steam to wash any sugar crystals from the sides of the pan. Then uncover the pan, insert a candy thermometer, and increase the heat to high. Do not stir it at all once you have removed the lid of the syrup will crystallize as it cools. Continue cooking until it reaches 240 degrees F. Remove from the heat and let the syrup cool for 15 minutes. Ladle into clean jars and attach the lids. Store it at room temperature for up to two months. If the syrup begins to form crystals at the bottom of the jar, don’t be alarmed; pour out the amount of syrup you need when you use it, without scraping the jar. Discard any crystallized part that is left in jar. It’s essential to use “lite” coconut milk. The marshmallow batter cannot support all that fat. Please read all the instructions first and have everything in place before starting. First make the bloom. Place the gelatin in a small bowl and stir in the coconut milk until there are no lumps. Set the bowl near the stove. Place the base ingredients in a heavy 4-quart saucepan over medium heat. Bring the mixture to a boil, cover the pan, and boil for two minutes. Remove the cover, insert a candy thermometer, and cook the base to 260 degrees F. Do not stir the mixture once the lid has been removed. When the base reaches 260 degrees F, turn off the heat, remove the thermometer, and stir in the bloomed gelatin. Pour the batter into the bowl of a stand mixer and gradually increase the speed to high (Use the wisk attachment). Cover the mixer with a clean kitchen towel for the first 3 or 4 minutes to avoid splattering hot liquid on yourself. Beat the batter for a total of 12 minutes. When there is just 1 minute of beating time left, very slowly drizzle in the “lite” coconut milk. Then continue beating for another 30 seconds. Scrape the mixture into the prepared pan and let it cure, uncovered, for at least 4 hours or overnight. Preheat the oven to 325 degrees F and spread the coconut evenly in 1 layer on a baking sheet. Bake in a preheated oven for 20 to 30 minutes, stirring often. (My coconut toasted perfectly in 12 minutes. I stirred every 5 minutes. So check it often). Cut the marshmallows as desired, and coat them with the toasted coconut. (I oiled a pizza cutter and used a clean ruler as a cutting guide and cut them into squares). Store in an airtight container, with a corner slightly ajar, for up to 2 weeks. Recipe from the book "Marshmallows, Homemade Gourmet Treats" by Eileen Talanian. Pictures by Laura Flowers. Update: Clara just drew out number 37. So that would be Patricia over at Butteryum. Please send contact info soon to Laurajeanne25@yahoo.com and I'll send you your stuff. Congratulations!! The marshmallows look SO good but I am a coconut fiend. It's so hard to say what my favorite food is, but if I really had to pick I'd say spaghetti and meatballs. It's really comfort food for me. I like it swimming in tomato sauce, and I have a lot of fond memories of making everything - pasta, sauce, and meatballs - from scratch with my parents. 100 is a milestone, Laura. What makes your 100 special is that they have all been beautiful. Every single one! You'll continue to grow and are well on your way to being a blogging super star. I couldn't be more happy for you. I need to put on a bib, just looking at that gooey and creamy marshmallows. What is my favorite food? Hmmmm... it depends on what food photo I'm looking at. That's what I want! I'd have to say-- overall... a perfectly grilled steak, baked potato with butter, fresh chives and sour cream and a beautiful green salad. Heaven! There was a recipe for marshmellows in the "Booze bible" aka the local liquor stores strange monthly magazine... and I really wanted to try them but then obviously got distracted by my purchases that day. Anyway - free marshmellows?! My favorite food would have to be garlic fingers - Pizza dough covered in salt, some sort of garlic butter/oil and cheese. But I only like them home made - never frozen. 100 Posts, 100 beautiful pictures. I still remember your first blogs, you didn't write anything but the recipe, some how after following you on my space I wanted to get an idea who was the woman behind the vespa!! Now I have more than an idea of who you are everytime you write a new post or when we exchange an email. CONGRATULATIONS GREAT FRIEND!! You were the one who started to bring followers to my blog. Thank you so much for your wonderful words, you really touch me, specially today that has been really hard on me ( please go to your inbox). I'm a lurker on your blog, and have many saved to my favorites :) Here's to another 100 more to come!! tis a tough question...my fav food fresh coconut and marshmellow of course! I agree with everything you have said about blogging~ Who knew? And we need to come up w/ a prettier name for it! It's just too wonderful to be called blogging. Hopefully someone can change it~! But it was delicious! And I have many printed and waiting. I love coming to my Blogger page of who I follow ..and read up..some days are busier than others and I can't comment..but if I have time..I .like to. I appreciate all the work.. care ...attention ..creativity and time you put into your blog. The thing I like best about this hobby..is the sharing. My mom LOVES these, and since we are having a big 60th birthday bash for her here in a few weeks, I think I am going to use this recipe to whip up a batch! Thanks for the great idea! My favourite food... What a tough question! I think it would be pretty much anything enjoyed with my husband, with a glass of wine, in a kid free restaurant... Oh, the joys of a scream free meal! Your blog and recipes are wonderful which is why I keep returning- and I love your photos too! 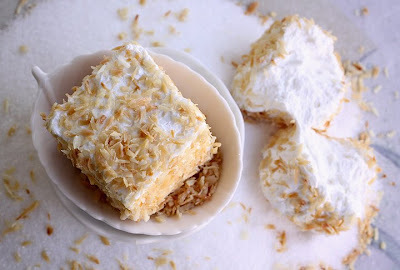 I was going to say, "Mashed potatoes are my favorite food because they are delicious, versatile,warm ,creamy, fattening, & starchy thus, bringing comfort to my weary soul", but after seeing today's recipe, I'd have to say ,"Coconut Marshmallows, because you make them look irresistible in the photo!" A favorite for me is difficult to say the least, as I work with food non-stop. That being said, I'll go with a simple tropical fruit, perhaps because our temps are in the high 90s, mangoes. I lived in VT for 23 years and mangoes always reminded there were places that had sunshine and beaches. As for your marshmallows, Louis, my partner, loves them, they'd be a gift for him. Nice way to celebrate your success. Congratulations! Never had a homemade marshmallow! Have a feelin it would become an obsession!!! My favorite food... Man, that's REALLY tough. I love food, all kinds... My very fav, just can't resist it would probably be ice cream. We've been hitting 100+ days here in TX and it's perfect to cool down. I especially enjoy it since I got my ice cream maker and can make it myself!!! Well, anything you have posted has been my favorite food. actually I change quite frequently re: favs. Last week, it was Spring Salad, ya know cut up veggies and a sweet mao sauce with pasta. This week after tomorrow it might be coconut marshmallows... CONGRATS on your 100th post!!!! I'm on 60 and you reminded me that it sneeks up on you fast, I better start thinking about it!!! my favorite food is chocolate because it just tastes so good. Hey lady! Why didnt I know about this blog sooner? Congrats on the centenial!! My fav food...? HA! That's like asking a parent their favorite child! I seem to be on a real Indian food kick lately, ut I could never narrow it down to one dish. I have never tried homemade marshmallows, but I know I would love them! I love dark chocolate with raspberry anything. Especially chocolate lava cakes. You may be surprised that you've already made it to your 100th post and that your blog has become so popular, but I'm not! You make wonderful food, take incredible pictures and your blogs are very well-written. The perfect combinantion to make a successful food blog (in my amateur oppinion)! Thank YOU for being such an inspiration as well. Keep up the good work. Anyway, I love this idea of a give-away! Maybe if I ever become a dedicated blogger (other than myspace I mean) I'll steal this idea. My favorite food? OMgosh, isn't that like picking your favorite child????!!!!! Seriously, I can NOT just pick a single food. But I CAN choose a particular type of food and that's DESSERT. More specifically, cookies. I love cookies but for some reason I don't make them very often. Guess that's a good thing (for my waistline, at least). I love bread and butter! A nice crusty thick piece of bread with good butter. i love marshmallows!!! favorite food- love panang curry!!! Congratulations on your 100th post Laura! I always love coming and looking at your beautiful pictures and drool over these yummy recipes! My favorite food? Oh boy-that's a hard one....growing up Italian, it seems all we did was eat! I would have to say my "guilty pleasure" is cheesecake......I savor every bite because I don't have it often. Soup! With fresh bread, of course. Congrats on your 100 posts!! Way to go. here's to 100 more.. I'm holding up a mojito. My fav meal would have to be the comfort meal my hubby cooks for me, the chicken mutz and butterred peas. Always made with love and always made for a reason.. why its my favorite! Laura - congratulations on 100 posts!! Food blogging is so much fun especially when I get to "meet" great people such as you! My favorite food? : my mom's beef noodle soup. It is the most extraordinary combination of Taiwanese comfort in one noodley lovliness. Think lean cuts of beef, bok choy, udon noodles, pickled veggies, all simmering in a slow-cooked broth made of five spice,chicken broth, soy, sesame and shitake mushrooms... yum!!! It is the taste of home and makes me appreciate my amazing mother. Congrats! I am salivating over the marshmallows! Congrats on making it to 100 posts! Your coconut marshmallows look so good! My favorite food? I love anything sour so I would have to say that my favorite is a Persian saffron rice dish with sour barberries. It's amazing. Hmm. My favorite food would have to be fresh-picked red raspberries ... still warm from the sun. : ) Just love those. Congratulations on the 100th post! Time flies!!! 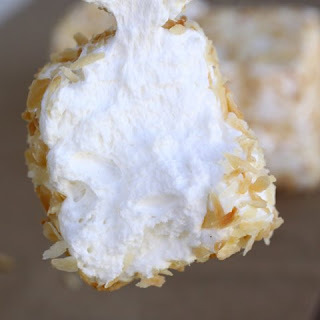 And these marshmallows look delicious, toasted coconut on anything makes it heavenly! My morning bowl of cereal which contains the following: grapes, strawberries, almonds, Fiber One, flax seeds, bran, psyllium, cinnamon and 1% milk. It's my favourite because (1) I'm a fiber-Nazi and try to get those 30 gr a day at all cost! Also, (2) because I have like a little ceremony around preparing it, it takes a bit of time, but it calms me down and comforts me. And (3) it's so healthy I just feel like a got a great start to my day! It's really hard to pick a favorite food, but I think I'd have to go with pizza, because it's so delicious and so versatile...I pretty much like all the kinds, from Pizza Hut to homemade to the local gourmet vegetarian pizza place. Yum! :) - what a wonderfully friendly blog world we live in!! You're one of my blog idols ;). Congrats on your 100th post Laura! Let's see... my absolute favorite thing to eat is eggplant parmesan - I requested for my birthday dinner every single year when I was growing up. I can't tell you why, but to me, it's pure heaven! Here's to the next 100!!! YUM! I can't wait to make these! My favorite food would have to be sushi. oh those marshmallows look delicious! My fave food is CUPCAKES! I'm glad I have some self control or I would stuff my face with cupcakes all day. The marshmallows look wonderful! I'd love to know more about marshmallow making. That book looks fabulous! I think that my favorite food is probably peanut butter. So full of protein, so classic, and so versatile. It can go in pastas, stews, sandwiches, sauces, soups, as a spread, or, my favorite, in deserts! Wow, those look heavenly! My favorite food is chocolate brownies. They always smell way too good when they are baking. Yum! My favourite food is potatoes, because they're good cooked in so many different ways. Laura, I am honored, flattered and thrilled to be mentioned in that great line-up of bloggers and friends. I love your blog and do indeed feel a friendship across the miles and airwaves. It is friendships like this that keep me going and inspire me to cook, bake, blog and do it all a bit better everyday. Congrats on your 100th post (I completely missed my own!) and sorry I missed this great give-away - you know I moved and then promptly lost my internet connection for 2 weeks. I must try making these marshmallows!